Discussion in 'Need for Speed!' started by mshuler009, September 6, 2010. It's been a while since I've posted anything good on here and after thumbing through a few recent questions about ignition and what parts to use and why I thought I'd take a step back and truly explain ignition. After understanding it you can be able to choose for yourself what parts will work best and even be able to do basic diagnosis on a modern vehicle. 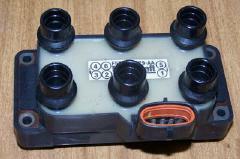 In an ignition coil you actually have two coils. A primary coil, and a secondary coil. The primary coil is the "control side"; and the secondary is the high voltage "output side" of the coil. When in start or run you have constant 12V to your ignition coil, but no ground. The ignition trigger (points, ICM, PCM) will close the ground momentarily and then open; and repeat over and over. What happens when the primary coil is given ground it builds a magnetic field, and when the ground is taken away the magnetic field collapses. When it does so the secondary coil cuts into the lines of flux (magnetic field) of the primary. The field is absorbed, and multiplied through the many more windings- thus creating a higher voltage. It is then discharged through the plug wire to the plug. If your vehicle still has one of these chances are is got a few miles on it. As far as I know the asian imports and Mopar are the last ones to utilize a system like this. It is still, however different from the old days. Back in the 50's and 60's DIS was used on just about every vehicle. They also utilized a ballast resistor in series with the coil in the run position only to drop voltage from 12v to 6v (to protect the coil). This system used a points and condensor triggering system. As the shaft of the distributor turned the "points" would open and close the ground to the coil; effectively caused the increased voltage output we talked about earlier. In today's vehicles this has been replaced by the ICM (Ignition Control Module) or PCM (Powertrain Control Module). 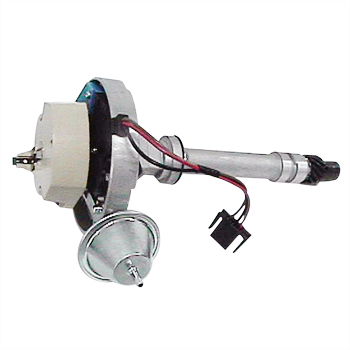 They utilize the CKP (Crankshaft Positioning Sensor) and CMP (Camshaft Positioning Sensor) to tell when to fire the coil(s). Just because of the system we're talking about I'm going to leave it at this so I can explain the more advanced systems. Ok, now that you know to have ignition you need a coil, and a trigger; then what the hell is that block looking thing on my 4.0? It is actually three ignition coils in one. and here's how it works: Wastespark? Where does the name come from? Well, in short- anytime a plug is fired, the companion cylinder is also fired. Although only one cylinder has the air/fuel charge compressed, the other one is fired on the exhaust stroke. Why? To complete the circuit. 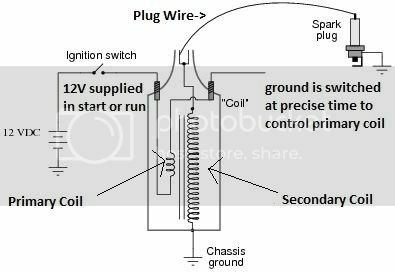 You see in wastespark one plug is fired electrode to groundstrap, and the other is fired groundstrap to electrode. This is why I recommend double platinum plugs on wastespark ignition systems. Each big hump in that "block" is in fact a coil. Three humps, three coils, for six cylinders. Don't let anyone tell you that the cylinder on the exhaust stroke is using voltage that should go to the other one. There is no resistance in that cylinder at the time the plug is wasted so virtually no voltage is used. The other cylinder is the one with the incredible amount of resistance (compressed air/fuel) in the cylinder. So, why have ignition systems evolved like this? Better spark timing control, more time to reach coil saturation (full voltage potential) because instead of one coil operating 8 cyls now you have 1 per cyl. And of course, longevity. If you have any questions or feel I missed something feel free to ask; I will try my best to answer your question to my best knowledge. Thank ya! Must remember to drink coffee before responding..